I’ve been in Georgia since the end of May to study for and take the Georgia Bar Exam. (I get results at the end of October, and the exam seems like it was so long ago! Wow!) I spent a lot of time applying for jobs––I estimate that I’ve applied to 30-40 by now––and while I’ve gotten a couple of interviews, I haven’t received a job offer. I have another interview this Thursday. If I don’t get that job, I’m moving back to Tennessee at the beginning of October to look for jobs and save some money. I’m looking forward to being close to some of my best friends, but I’m not looking forward to living with my parents. So my job hunt has come down to the wire; I won’t know whether I get to stay here until the very last moment, and it’s driving me crazy. I feel like I don’t have control over my life, and I hate that. I’ve been really stressed over the past few months trying to figure out what I’m going to do and dealing with family members who have their own life plan for me to follow. I’ve never experienced this total lack of direction in my life, and I’m still learning how to deal with it. Well. I just realized that I hadn’t posted since May 26, and that’s terrible. 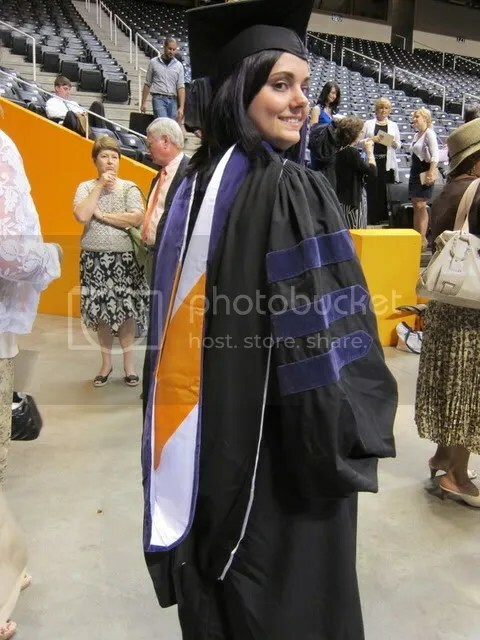 I graduated Law School and moved to Atlanta for Bar Review. I’m spending most of my mornings holed up in the Sheraton hotel in downtown Atlanta and my afternoons at my apartment, which I found on Craigslist. I’m seeing my boyfriend, Bill, two or three times a week, and I’m staying on top of my bar prep homework. Go me. The Bar Exam is on July 26-27–45 days away. After that, hopefully I’ll stay in Atlanta, but I honestly don’t know where I’ll be because I don’t have a steady job yet. I’m still blogging, though, and looking to turn that (and social media management in general) into a full-time gig. Other than that, not much is happening. I’m really enjoying being in Atlanta and getting to know a new city. OH. I saw the new X-Men movie last weekend, and it was awesome. Probably my favorite of all the X-Men movies, which is saying a lot because X-2 is one of my favorite movies ever. Okay. I’m going to work on some posts for a queue, so that I don’t go weeks without posting again for a while. I’m in the middle of filling out a Character and Fitness Application for the GA Bar, and I’m gobsmacked at how much of a money racket this is. Now, I’ve always felt like law school was a money racket, but most of those costs are extraneous and avoidable. Paying for the Bar, however, is mandatory, and having to drop so much money at once is discouraging and irritating. – $80 “notice of intent” that I’m going to apply for the TN Bar, and all the other trappings of that application, including a $100 laptop fee so that I don’t have to hand-write all those essays. I’m definitely keeping track of all of these costs, but I’m going to go on and estimate that the GA Bar, including the review classes, ends up costing me at least $4000. So the big question is: Is it worth it? I’ve got close to $100,000 in debt and NO job prospects. I want to move to Atlanta, which has a bigger job market, but I can’t afford to relocate. At this point, it definitely doesn’t seem worth it. I’m terrified about the idea of graduating and having nothing to do and nowhere to go but home to my parents’ house. I feel like all of these fees are HUGE barriers to entry into the profession. I realistically can’t afford $4000 per bar exam, but I have to be willing to fork it all out because otherwise I’m $100,000 in debt for a degree I’m not even using. And I want to use my law degree. I want to do IP law, and affect public policy, and, yes, make some money so I can pay off my debt and fund my hobbies. I just don’t want to go bankrupt before I even get my license, and the more I pay for fingerprints, background checks, and application fees, the more I worry about that.